When you think of the top brand names for tech out there, all begging for your hard earned cash, you're probably thinking of Apple, Samsung, and Microsoft. You're more than likely going to be thinking of those brands specifically. With their massive marketing campaigns it's no wonder that's just the way it is. But despite some great marketing we all have heard that news that Microsoft has been somewhat lacking in the sales department. There is however no lack of competitors that have picked up on this and started taking shots at the larger name brands. Companies like Lenovo are coming up with commercials, and overall marketing tactics, that are taking on the old school tech giants and pointing out legitimate facts. That being said, Lenovo seems to have their ducks in a row in terms of what they have to offer right now. Is it enough to take on the top dog though? 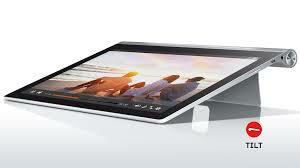 Lenovo prides itself on their Yoga line, mainly because of the devices remarkable ability to do Yoga... sort of. Essentially this name means that the device can bend in ways that a typical laptop couldn't and comes with touch screen capabilities to boot. This laptop is able to have it's screen bend all the way back to the point that the keyboard and the screen are facing back to back. You have the laptop's "tablet" mode where it could function as a laptop, and then you have the tent mode for when you'd like to watch movies or videos without holding the device. 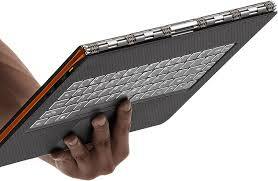 It's a laptop and tablet all in one, without the detachable keyboard niche. What's holding it back from really taking on Apple's Macbook Air? Let's just say $900 sounds a lot better for a product, than $1,300. When you think of tablets, you probably don't think about them including built-in projectors. With Lenovo's Yoga Tablet 2 Pro, that's actually exactly what you're getting though. This tablet comes in with a built-in pico projector that can throw a 50-inch theater image on any surface. Nifty? Completely. Necessary? Debatable. Yes, there are many implications that could be utilized with this device. Don't want to use your company's projector to get your presentation done? This tablet can display your presentation for you, and store everything else you may need. Do you just want to have a relaxing night with some friends watching cat videos and eating pizza? Well you can do that too if that's what you choose. The tablet itself has a 15 hour lifespan when not throwing images on walls. Not a bad life for a tablet at all, and again, the business uses for this really justify the use of the projector. Lenovo might have laptops that bend and turn in to tablets. They might have tablets that have projectors built into them. The only problem is that they're missing one crucial element; the fanbase. The market is flooded by the 3 main top tier competitors in the market and Lenovo just isn't one of them. This, in no way, suggests that their products are bad in any way shape or form. The fact that Apple still holds the largest portion of the consumer tech market means that it's just that much harder for the other two companies, and even more so for sister companies like Lenovo. The fact that they're using Microsoft's financial backing to create commercials that go up against the tech giant does say something about the company and it's products, however. There is no sure fire way to say whether or not Lenovo's products will hold a candle to Apple's product line, but if you're able to stand up to Apple, that shows that there is some merit there. Without a doubt though, Lenovo is definitely stepping up their game, and people should be on the lookout. Thinking Of A Tablet Rental For Your Next Event?